Shillong July 14 (IANS) Bangladeshi smugglers have become bolder after the Indian border guards started using pump-action guns instead of regular INSAS rifle along the border Director General of Border Security Force K.K. Sharma said on Friday. Sharma said the pump-action gun which is a non-lethal weapon is not used on India-Pakistan border. "BSF is following the policy of non-lethal weapons to reduce the killing of Bangladeshi nationals on the international border. Whenever a Bangladeshi is killed on the border the government in Bangladesh comes under tremendous pressure. "That s why we have been asked by our government to reduce the number of killings of Bangladeshi nationals on the border " the BSF chief told journalists here in Meghalaya. "Owing to this strategy the Bangladeshi smugglers has become bold and attacks on the BSF troopers have increased and roughly 150 BSF troopers are injured every year. Last year we lost one officer and another person in clashes with the Bangladesh smugglers " Sharma revealed. Moreover he said no Bangladeshi smugglers have been killed but only Indian smugglers have been killed by the BSF. Asked if non-lethal weapons are used in maintaining law and order situation in trouble-torn Srinagar the BSF chief said: "Non-lethal weapons are used only at the Bangladesh border and not on the Jammu and Kashmir border. We are not in law and order duty in Kashmir valley. "In Srinagar if there is a law and order BSF is not deployed ... it is the CRPF along with local police. At times if it is an encounter with the militants the army also comes in but the BSF is not involved. However I would not like to comment on the weapons used in Srinagar " Sharma said. Sharma said that the overall number of cattle smuggling to Bangladesh has come down in the last two to three years as a result of more deployment at crucial places and identification of vulnerable areas and better coordination with the local police. "BSF is the last agency to try and stop the cattle smuggling. Cattle is collected from all over the country and from the hinterland it is brought to the international border. In West Bengal there are many cattle haats very close to the international border and consequently it comes very difficult to stop 100 per cent the incidents of cattle smugglings." Noting that radicalisation of Islam is a worldwide phenomena Sharma said: "The government of India is very conscious and alive to the situation and all necessary steps have been taken to counter radicalisation in India. 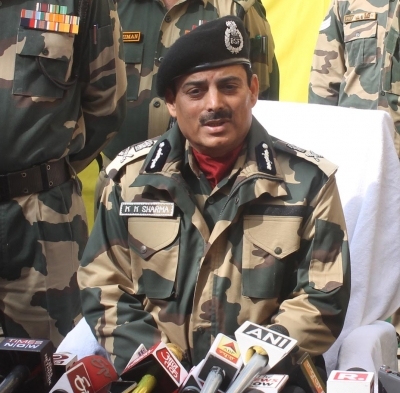 BSF is prepared to deal with any misadventure from the other side of the border."